The Moab Canyon Pathway is an 17 mile out and back paved path from a mile north of Moab heading north past Arches National Park to route 313, the turn off to Canyonlands National Park and Dead Horse Point State Park. The Moab Canyon Pathway starts at the Lion’s Park Trail hub a mile north of Moab at the Lion’s Park Trail Hub. Cross the bridge heading north to the entrance of Arches National Park where it climbs 525 vertical feet through Moab Canyon. At the top, it passes by Moab Brands Trails and continues passing under the road to the turn off for Canyonlands National Park and Dead Horse State Point. From there, turn around and enjoy the ride and the view from a different direction. 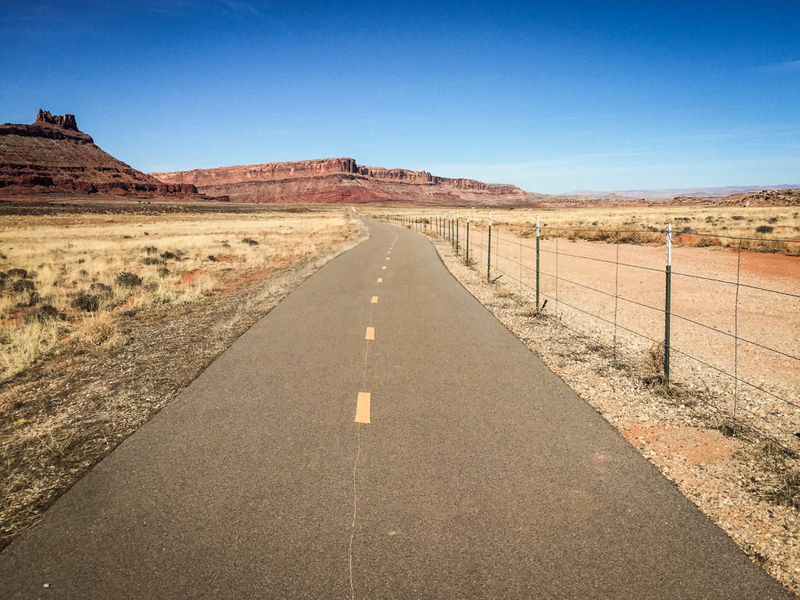 This pathway connects town with Arches National Park and the cycle-able road to Canyonlands National Park and Dead Horse Point State Park. The Moab Canyon Pathway is cleanly paved and passes through an area of geological significance called the Moab Fault, a well-studied geological fault as it has a displacement of 3,150 ft. forming the wall that is to the west. This fault runs 28 miles Northwest to Southeast along the western side of Arches National Park. For more information, go to the Visitor’s Center on Main St in town. Until recently, there were no great places for families to ride their bikes on paved pathways. There has been a concerted effort to build over 100 miles of non-motorized paved pathways. It also connects riders to the Moab Brands Trails, the Sovereign Trail (s), Gemini Bridges (Magnificent 7 trails), Bartlett Wash and Monitor and Merrimac areas. Parking is free and available at the Lion’s Park Trail Hub at the junction of 191 and 128 (River Road) on the south side of the Colorado River. Parking is also available in town and in the Visitors Center Parking Lot. There is no fee for using this paved trail.